atyn Forest is a wooded area near Gniezdovo village, a short distance from Smolensk in Russia where, in early 1940, the NKVD, on Stalin's orders shot and buried over 4000 Polish army officers that had been taken prisoner when the Soviet Union invaded Poland in September 1939 in support of the Germans, and were kept in the Kozielsk camp. 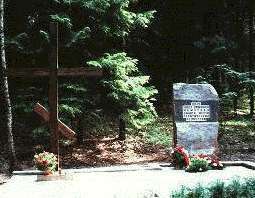 Katyn was not a single place of Polish martyrology. Other notorious places of Soviet crimes were Kharkov, where NKVD murdered circa 3800 people imprizoned in Starobyelsk, and Tver, a place of murder of more than 6000 prizoners from Ostashkov. Among Soviet victims there were also Popiels. Katyn. "Sandomierskie Zeszyty Biograficzne", zeszyt 1, pazdziernik 1995.